A new cookbook in the series that reveals the best ways to use specialty olive oils and vinegars in international cuisines—now featuring the succulent, flavourful dishes of Syria. Danielle (DL) Acken is a Canadian-born international food writer and photographer who splits her time between London, UK and her farm studio on Canada’s beautiful Salt Spring Island. See her work at dlacken.com. Emily Lycopolus is a recipe developer, the author of six olive oil-focused cookbooks, a level two olive oil sommelier, and the co-founder of eatcreative.ca, a food-driven creative content agency, and the founder of The Olive Oil Critic (oliveoilcritic.com). Her family owns an olive grove in central Italy, where her love of olive oil began. She lives in Victoria, BC. 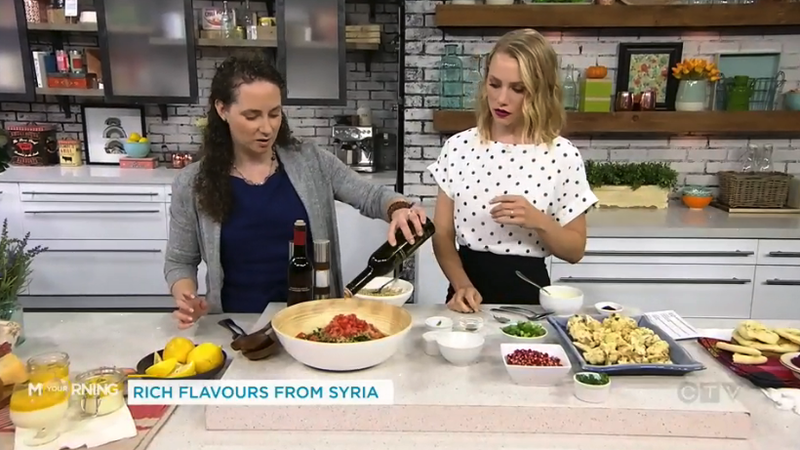 Emily visited CTV’s Your Morning to demonstrate some simple and delicious recipes from Syria. Watch the clip here.